This is soooo easy! I have been making easy homemade bagel bites..FOREVER! To save myself some work I make tons of them and freeze them on paper plates in a freezer bag. Boom.. Bagel Bites.. Better than store bought, cheaper than store bought, bigger than store bought! I am ALL ABOUT making life easier for myself and my family and as much as I love cooking, time is at a premium for busy families and so I try to make as many Easy Freezer Meals and Snacks ahead of time as I can. Cost is a huge factor for staying budget also and making your own snacks can really cut down on the grocery budget! Add what ever you like! Then Flash Freeze the Bagels. 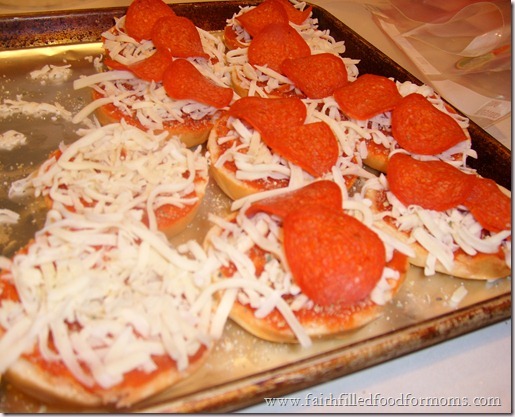 This simply means a quick freeze ~ place the cookie sheet into the freezer (you don’t even have to cover the bagels) for about 1 hour. 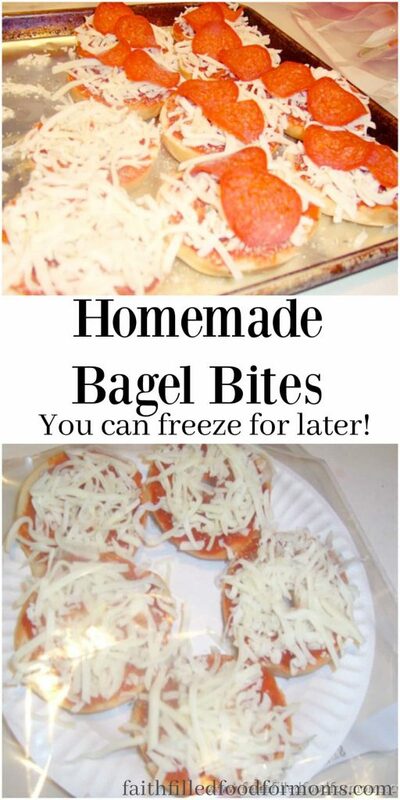 Bring out of the freezer and place onto a Paper Plate ~ this is so the Homemade Bagel Bites lie flat and don’t get all jumbled up in while storing in the freezer. 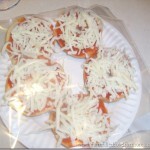 Place the whole paper plate with Bagels on top, into a freezer bag and freeze. 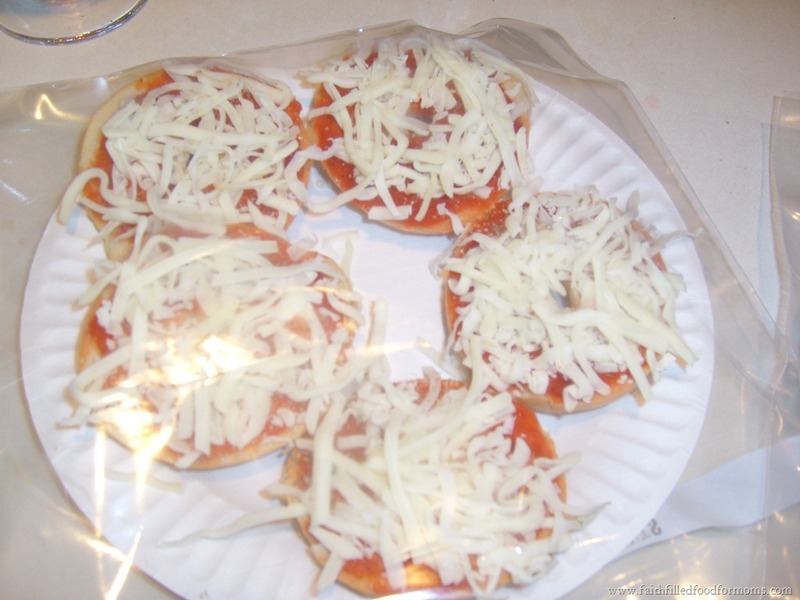 For Cooking we just microwave for about 1 minute per Bagel Bite. 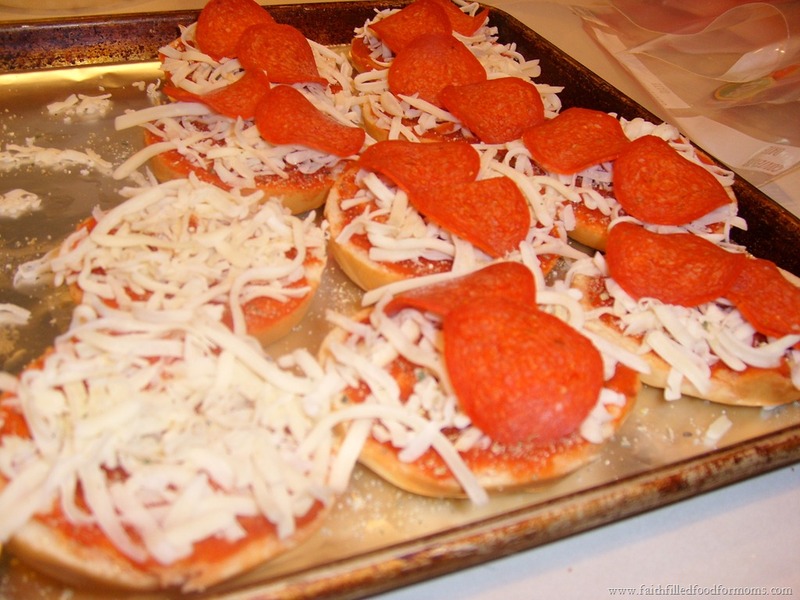 in •any toppings you want I have turkey pepperoni pic. 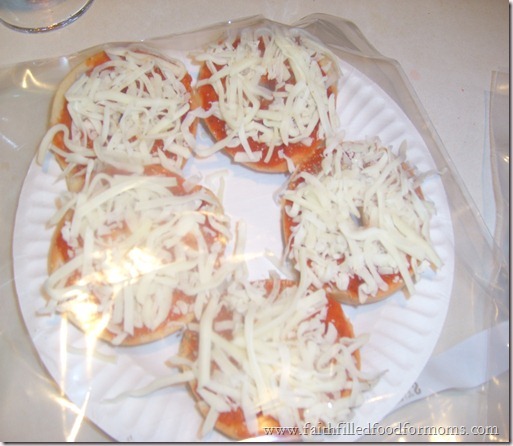 Put onto a Paper Plate and put the whole paper with Bagels on top into a freezer bag and freeze. Oh I’ll do anything to save a little time and money!! How about you! What are you whipping up and freezing? I’m pretty sure if you are a super busy family you will need these Quick Easy Dinners for Families! All are kid friendly and deelish! This looks yummy! Makes me hungry! Yay! I’m glad..LOL Thanks for stopping by Christy! Blessings! Hi Amy! Thanks so much for stopping by..these are soooo easy LOL not too Spiritual though LOL I love Genesis so much! I especially love how God’s Spirit Hovored over the earth before anything was ever created..God is soooo amazing isn’t he 🙂 Blessings! oh my, another delicious recipe, and so simple too. Don’t feel bad. My son loves bagel bites and could probably eat them 24-7 if I allowed it lol. Never thought to make them myself lol. Great idea! Hey there Snowies!! Thanks for stopping by! 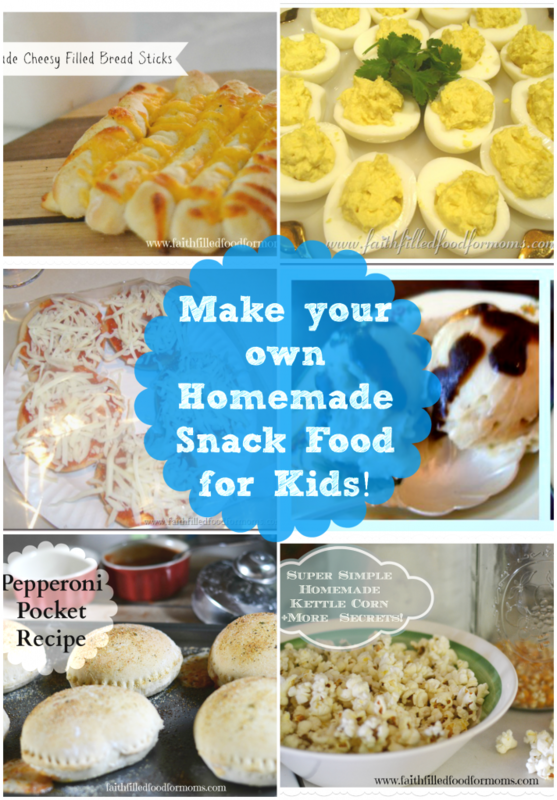 It is sooo much cheaper to make these ourselves and so easy 🙂 My kids eat these like crazy too! Blessings! Hi Bre! I’m so happy that your kids liked them…and aren’t they just sooo easy! Way cheaper too. Thanks so much for stopping by! Hi Shari Lynne! Another ingenious recipe from you! Thanks for sharing! Blessings from Bama!